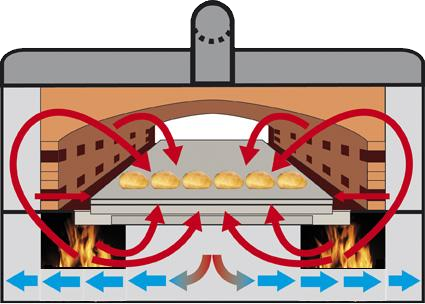 EMBRACING HEAT: An innovative, patent pending, system with double circulation of fumes. This allows a perfect propagation of the heat inside the baking chamber, without forced turbulences in order to balance the heat in the different areas. 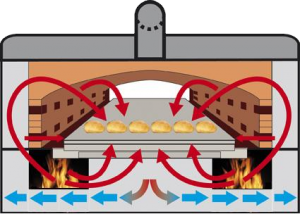 REFRACTORY MATERIAL FOR A SLOW RELEASING HEAT: Built in stone and refractory materials, just like traditional wood fired ovens, this oven allows an evenly-distributed accumulation of heat, granting baking stability for all kinds of products. The ovens bedplate is built in natural stone. EVEN BAKING ON THE WHOLE SURFACE OF THE OVEN: The heat wraps the products with an exceptional force , allowing an unequalled development of the product. MODULARITY: Completely built in independent units, both for the heat source and the circulation of fumes. This oven allows the creation of a perfect baking curve for each product. POWER PERFORMANCE: the Power performance is extremely efficient, thanks to great insulation and the low temperatures of outgoing smokes. The basic CLM VESUVIO uses only natural gas. It is also available in the wood fired version, a revolutionary feature in the field of industrial ovens for bread and pizza.